By now you have probably heard that the new WHFB Ogre Kingdoms book will be released this week and I am very excited about it. My ogres are so ready for it. I have been following the rumors on the Internet, especially over at the Ogre Stronghold forums, for the past few weeks about what the new book has and I think I have a pretty good idea of what to expect. With that in mind, I have taken inventory of what I have so that I can start planning some lists when the book comes out. Here is what I currently have. 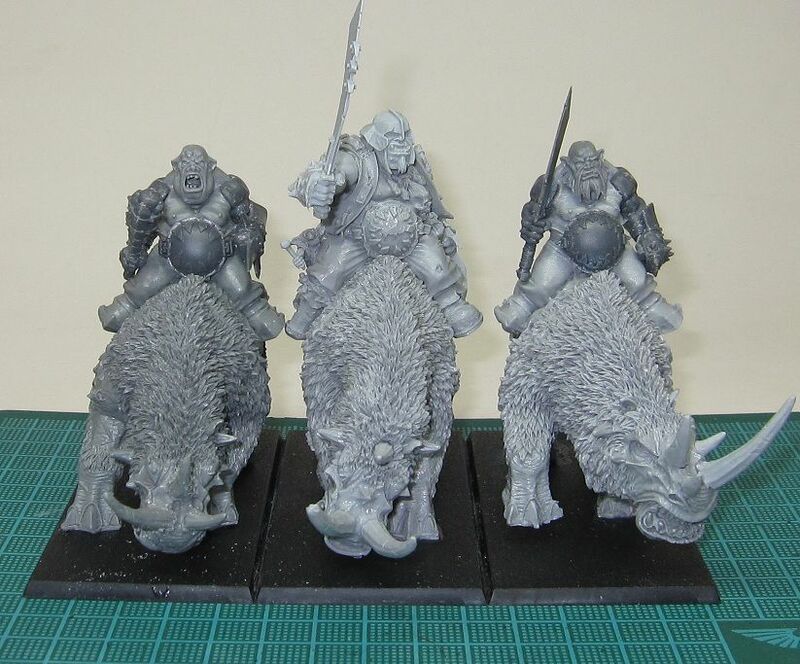 I will most likely be using the Rhinox Riders as Mournfang Cavalry at least until Forge World releases rules for them. As for what I have that I still need to build. I am waiting on building the Ogres (I miss calling them Bulls) until the book comes out to see how to equip them. 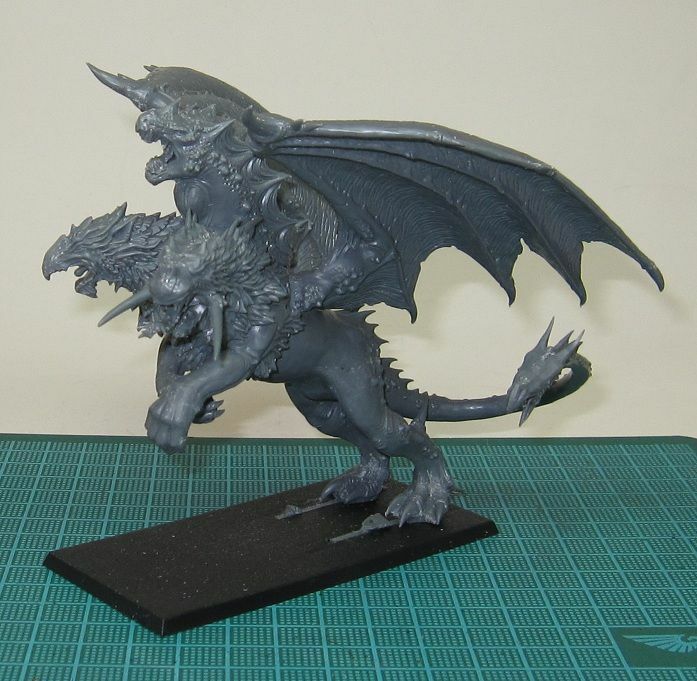 As for what I am planning on buying for the new release, I definately want both a Stonehorn and a Thundertusk. 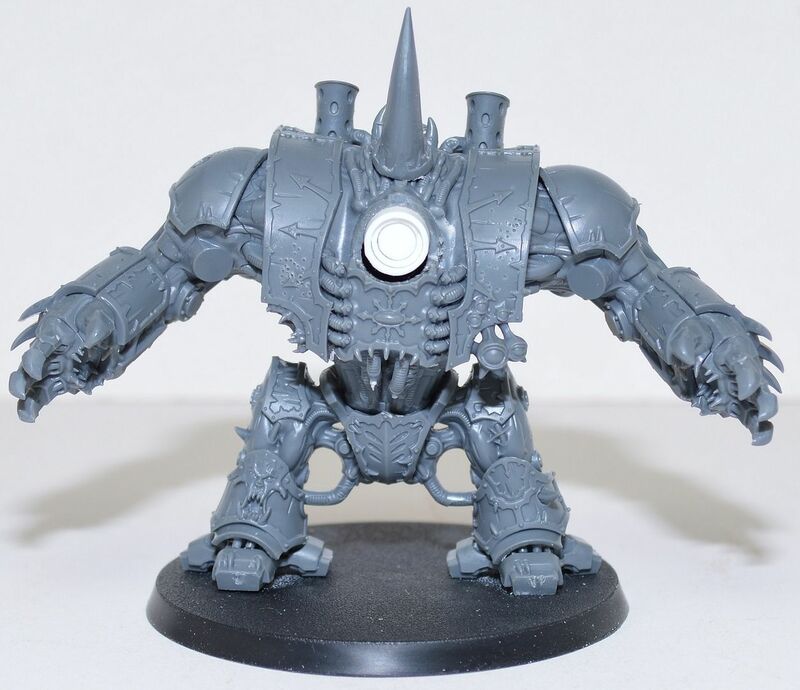 I will probably be picking up an Ironblaster and a Scraplauncher. 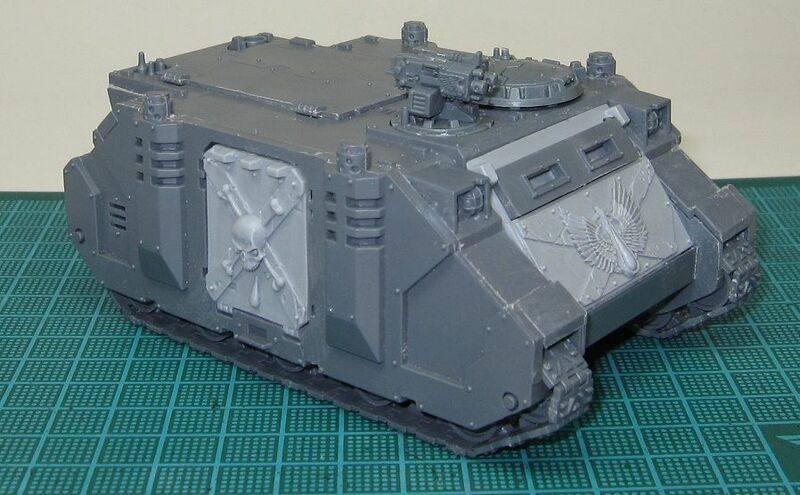 I really should get the two Maneaters I am missing (Ninja and Imperial) as that will give me a unit of six (Maneaters are a Special choice now and are really good from what I hear). I also want a Firebelly. That will probably be more than enough stuff to keep me busy for a while. I have finished three of my four painting projects for this month: Scabieathrax, my third Blight Drone, and a Herald of Nurgle. 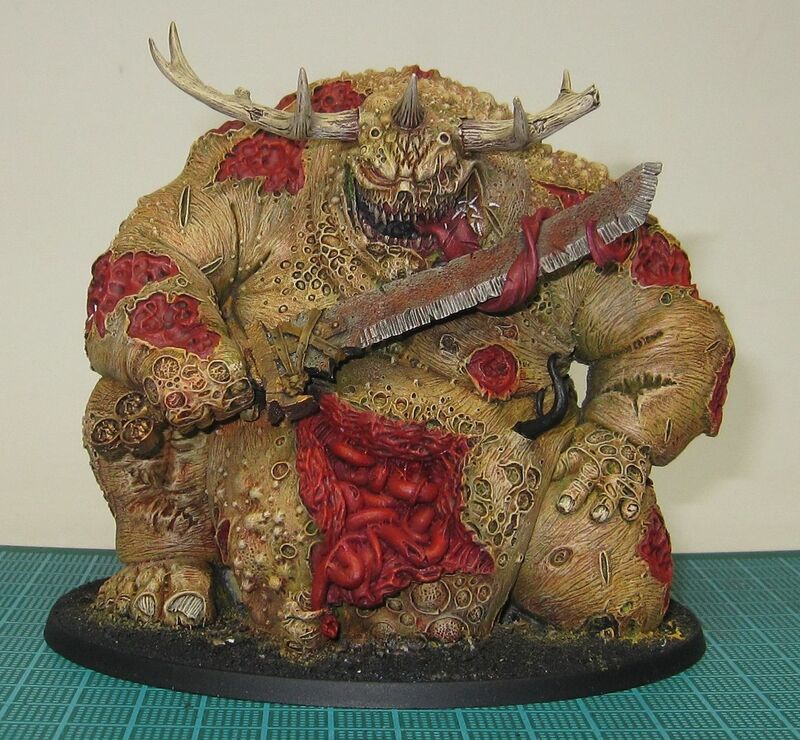 I am still working on Epidemius, the fourth model, but I should not have an issue finishing him by the end of the month. On top of making it to Tuesday Night gaming for the second week in a row, I got a lot of stuff built this week. First up, I built my first Malifaux crew. I am still waiting to hear back from Wyrd about the missing arm for Santiago, but other than that they are ready for basing and priming. 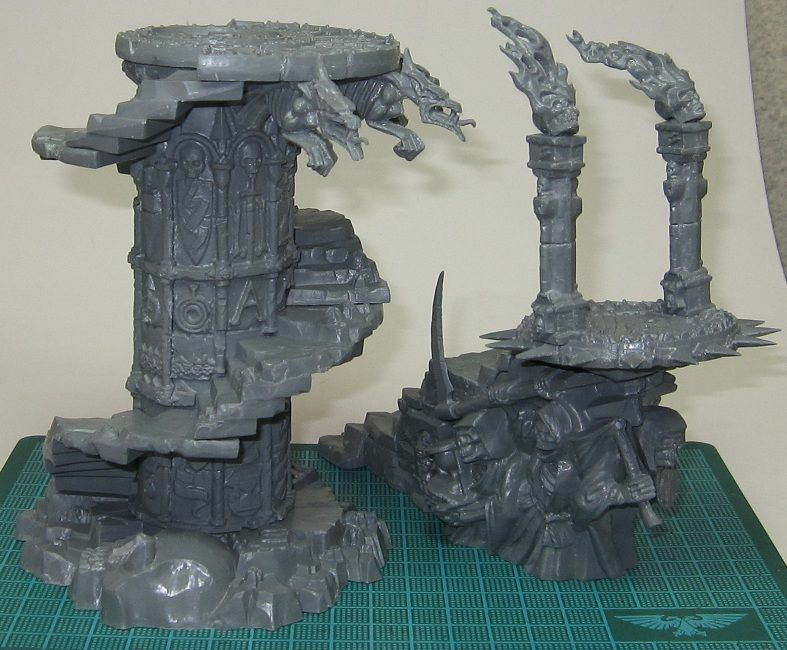 Next, I finished building the last of my Forge World order. I still have some green stuff work to do on the Rhinox Riders (around the horns of the Rhinox and the shoulders of the riders) before they are ready for priming. And lastly, I have built the Storm of Magic items I picked up back when it was released. With the new Ogre Kingdoms book due out next month, I am looking forward to getting some SoM games in with my Ogres. I also did some painting this week as well, here is my WIP Scabieathrax. What do you think of my painting so far? After my trail game of Malifaux on Monday night, I could no longer resist it and I bought the rulebook, a fate deck, and the Perdita boxed set last night. I went with Perdita's crew because it seemd like the best starter crew Unfortunately, the Santiago model in my boxed set is missing his arm. I have already contacted Wyrd about a replacement. I hear they have really good customer service, but I probably will not get it until GenCon is over. When I said wanted to try a game that was different, it seems Malifaux was it. I think what sold me the most was that it uses cards instead fo dice. A really nice change. I am still going to try Infinity and Warmachine and may end up getting into those as well, but we will see. I am really looking forward to playing more Malifaux. Monday nights are Malifaux nights at my FLGS, so I think I will have plenty of opportunities, at least until Monday Night Football starts. BTW, I am now on Twitter, so feel free to follow me for more frequent updates. I was able to get to my FLGS last night for my first 40k game in several months and it was good. I took my Nurgle Daemons and ended up playing a 2250 point game against a team of Grey Knights and Space Wolves. It was a fun game but it was a Capture & Control mission that ended in a Draw (as they almost always do). 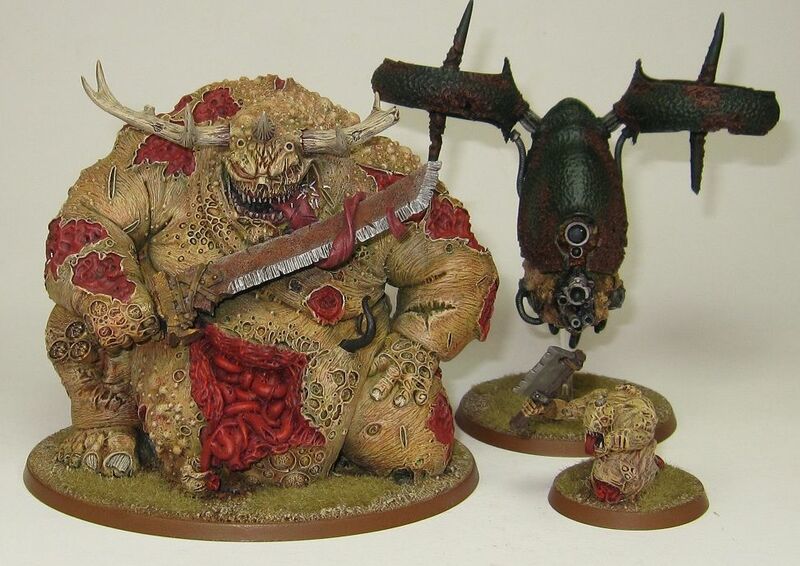 Anyway, I got to thinking about my sizable Nurgle Daemon army and if it would be fun to play them in WHFB. While all my models have round bases, use of some customized movement trays would allow me to play them in rank and file formations. So, I wrote up this 2000 point list and I am looking for feedback on it. I would need to convert the two Heralds of Nurgle, but everything else is ready to go. What do you think, is this list feasible? Rhellion was kind enough to walk me through a demo game of Malifaux last night and I have to say I enjoyed it. While I am not settled on Malifaux as of yet, there are some aspects of the game that I really liked. We played a 15 point game. I played a Guild warband with Perdita, Nino and Santiago. Rhellion played Arcanists with Rasputina, an Ice Golem and an Ice Gamin. I think I won because Santiago was apparently very trigger happy and would not stop shooting. As for the game system, I like the fluff of the game and the models are awesome. There is quite a wide array of models to choose from. You can play anything from Wild West Gunslingers to Zombie Hookers to Demons to a giant killer Teddy bear. There is a certain 'creepiness' to this game that really appeals to me. I like the use of cards instead of dice. It added a whole new dimension to the game with being able to 'cheat' fate with the cards in your hand. I have downloaded the rules manual from the Malifaux website so that I can read more. As for the other game systems I am interested in, I have a demo game of Infinity set up for next Tuesday. Still looking for someone to demo Warmachine for me.